This is a test and only a test. I crocheted this pineapple pattern to test it for a possible bedspread. What I liked was that the border matched the pattern on the squares. I found it really hard to block the crochet into a square since it started out as a circle. It was a struggle to pull the sides out and make the corners right, over time they have reverted back to less than 90 degrees. I still see possibilities for a bedspread. Maybe a less tightly spun thread, or a looser crochet stitch. I just need the time to do another test to be sure about this pattern. 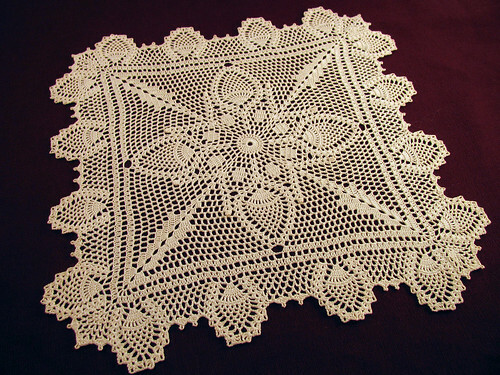 This entry was posted on Thursday, January 22nd, 2009 at 3:00 am and is filed under Crochet and Lace. Tagged: Crochet, Doily, Lace, Thread. You can feed this entry. You can leave a response, or trackback from your own site. Your work is so beautiful! It’s gorgeous!